As can be seen in the data sheet for Siglent’s SDG2000X arbitrary waveform generator series, the sampling rate specification (1.2 GSa/s) is followed by a note of “4X Interpolation”. This may be confusing to some customers, even some experienced users of function generators. This white paper is intended to explain this specification and to discuss the advantages of the Interpolated DDS technique compared to a traditional DDS based function generator. 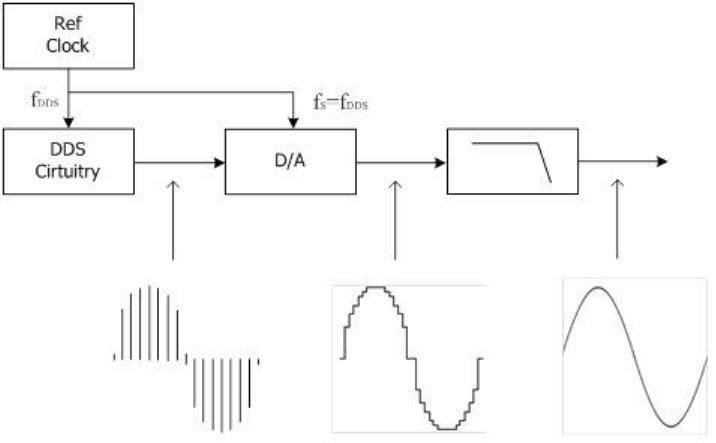 The figure below shows the basic design of a traditional DDS system, in which digital waveform data is output in response to a reference clock for the DDS circuitry, then converted by the D/A converter using the same clock. That is to say, in a traditional DDS structure the clock for the DDS and for the D/A converter running at the same frequency. reconstruction filter is also applied. Siglent’s SDG2000X applies this technique with the interpolation factor I = 4. The reference clock of the DDS circuitry on the SDG2000X is 300 MHz. Using the interpolation circuitry, the sampling clock of the D/A converter is increased to 1.2 GHz. This is the explanation behind 1.2 GSa/s specification found in the data sheet – 1.2 GSa/s followed by a “4X interpolation” note. This explains the mechanics behind the interpolated sampling technique. However, what is the technical reasoning behind Siglent’s innovative sampling technique? 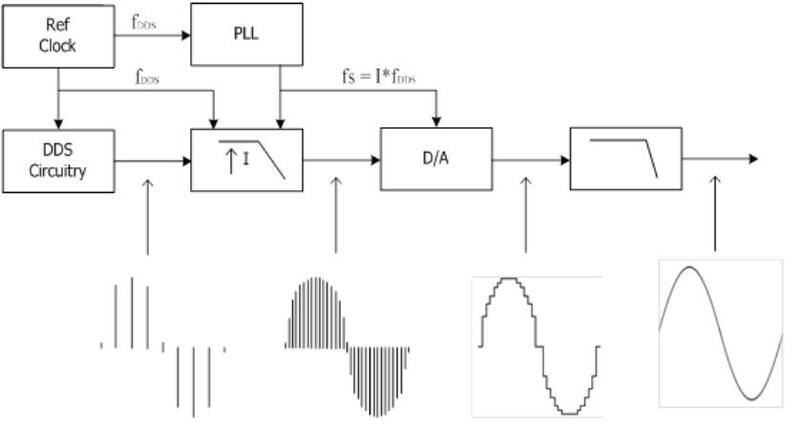 First, let’s compare the waveform in the time domain using the two different sample rates. Looking at the output waveform of the D/A, the 1.2 GSa/s sample rate results in smaller steps (higher resolution) than with the 300 MSa/s sampling clock (Fig 3). The figure below shows a spectrum example in which an 80 MHz sine wave is output by a D/A with 300 MSa/s. Output spectrum of the D/A includes the fundamental, and its image frequencies N· fs ± fout, N=1,2…. Amplitudes of all the spectrum components comply with the sin(x)/x envelope. Usage of the reconstruction filter is to filter all of the image frequencies which are located outside the Nyquist bandwidth. 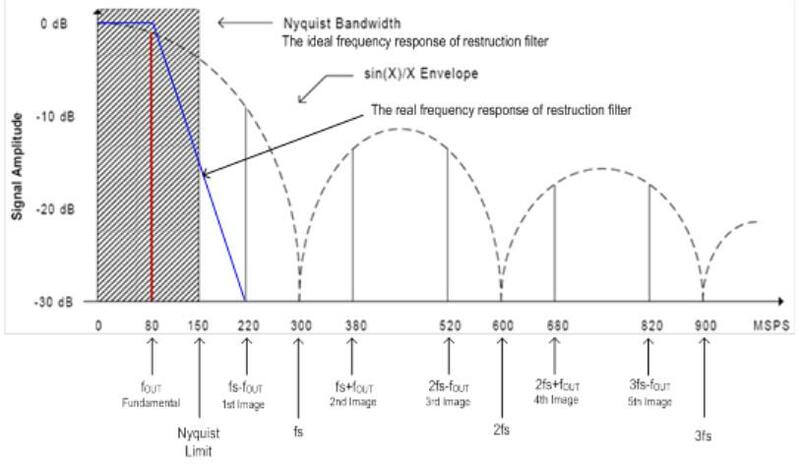 An ideal reconstruction filter should retain all the signals located in the Nyquist bandwidth, and filter out the ones outside it. In other words, its frequency response should be coincident with the Nyquist bandwidth, as the shadow part in Figure 4. In this case, the maximum frequency can reach the Nyquist Limit (e.g. 1/2 sampling clock frequency). Figure 4 shows the spectrum of the output from a 300 MSa/s A/D converter with an output frequency of 80 MHz. The nearest image occurs at 220 MHz so the maximum roll-off would occur at 140 MHz. But for a 150 MHz signal, the nearest image is 300 – 150 = 150 MHz, the space remaining for roll-off is zero, which is not realizable. 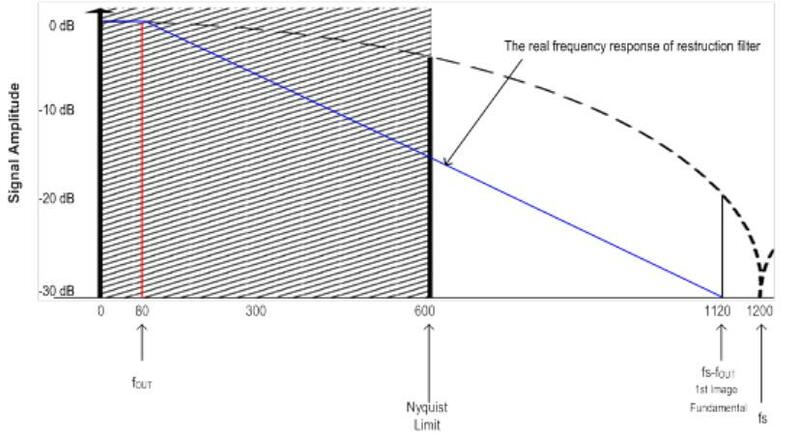 Generally, the limit bandwidth of a reconstruction filter is 40% of the sampling clock. That is to say, for a 300 MSa/s D/A, the maximum available output frequency is 120 MHz. The figure below shows 2 reconstruction filter designs with roll offs from 120 MHz to 180 MHz. Both designs are 9-order elliptic filters. The difference is the design on the left uses ideal components, and the one on the right uses real-world components, with parasitic parameters. As we can see, a real filter has an extra ~3dB attenuation on the corner frequency (i.e. 120 MHz), and its attenuation performance on the stop band cutoff frequency (i.e. 180 MHz) degrades. In addition, the sin(x)/x envelope of the D/A’s response itself will add attenuation to the signal. At 40% of the sampling clock (e.g. 120 MHz in Figure 4), the attenuation caused by the D/A is about 2.4 dB. An inverse sin(x)/x filter is generally necessary to compensate this attenuation. If the sampling rate of D/A is 1.2 GSa/s, for a 80 MHz signal, the nearest image is 1.12 GHz, so the maximum roll off of reconstruction filter could be 1.04 GHz, as shown in Figure 6. Design of the reconstruction filter is greatly simplified. 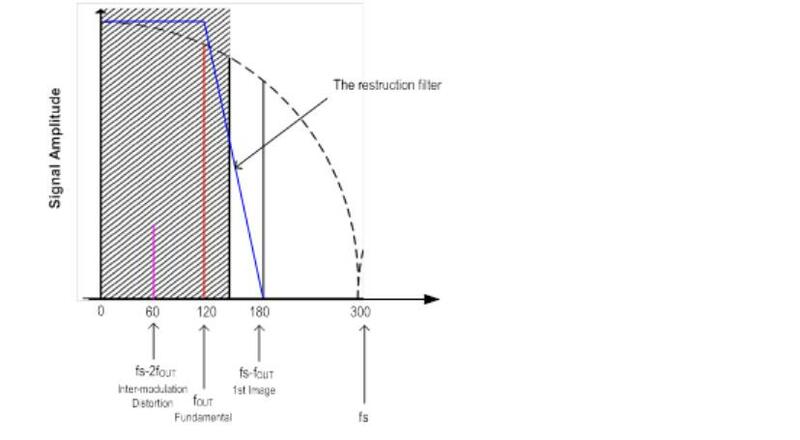 Figure 7 shows the real reconstruction filter design with roll off from 120 MHz to 1.08 GHz. This is much easier to achieve than the one with roll off from 120 MHz to 180 MHz. On the other hand, as the main lobe width of the sin(x)/x envelope increases, the attenuation contributed by the D/A decreases. At 120 MHz, the attenuation caused by the 1.2 GSa/s D/A is approximately 0.14 dB, which can be ignored in most cases. No more inverse sin(x)/x filtering is needed. Based on the above, because of limits of the reconstruction filter a 300 MSa/s D/A can only output a 120 MHz maximum frequency. But a 1.2 GSa/s D/A can achieve a higher upper frequency limit. Of course in the interpolated DDS structure, the digital filter in the interpolator will restrict the frequency to the Nyquist limit of the DDS clock (e.g. 150 MHz), but a digital filter is much easier to design than an analog reconstruction filter. Using the interpolated DDS, it is easy to raise the upper limit of output frequency from 120 MHz to 130 MHz or more. Intermodulation distortion is unavoidable in a D/A converter. 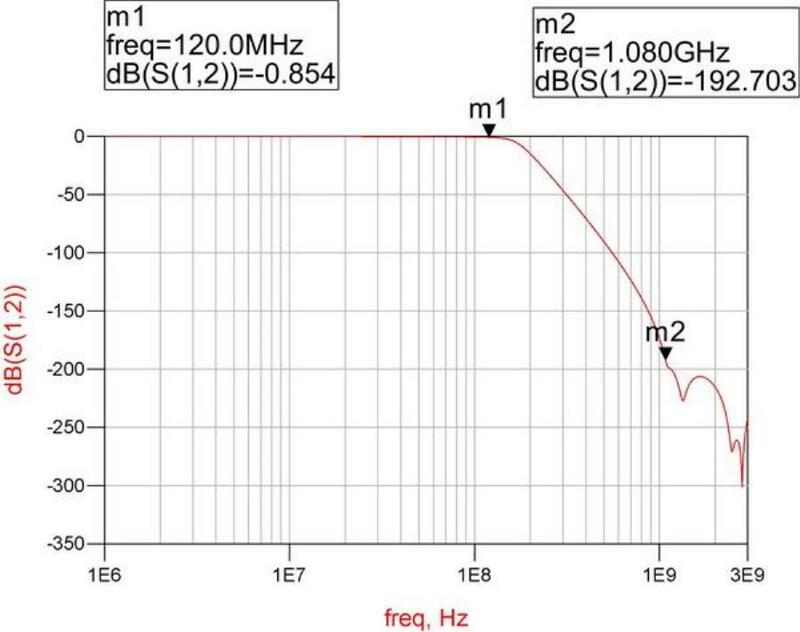 In a traditional DDS structure, it is difficult to remove some inter-modulation distortion components between the clock and the output signal, such as fs -2fout, fs -3fout . 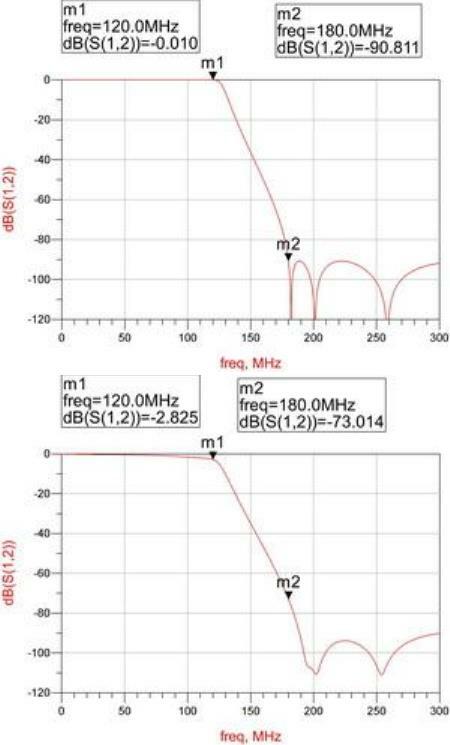 The figure below shows an example with 120 MHz output frequency and 300 MSa/s sampling rate. The distortion = fs -2fout = 60 MHz falls into the passband of the reconstruction filter. It is not possible to be removed. But with a 4X interpolated DDS structure, for 120 MHz frequency output, the distortion components = fs -2fout = 960 MHz, fs -3fout = 840 MHz, which are located far away from passband of the reconstruction filter. Compared with a traditional DDS design, the Interpolated DDS technique inserts an interpolator between the DDS circuitry and the D/A converter, yielding a higher sampling rate. With such a structure the design of the reconstruction filter is no longer the bottleneck for bandwidth. On the other hand, the problems due to intermodulation distortion products falling into the passband of the reconstruction filter is solved, resulting in better SFDR performance.